Salt makes our food taste better, but too much of it is bad for our health. Monitoring our salt intake is one of the simplest things we can do to be healthy. We are aiming for a maximum of 6 grams per day. There is a history of high blood pressure in my family, so I have been monitoring my salt intake for a number of years. It was oddly enough what set me on the path of ‘eating myself healthy’. Like most people I did not want to be in the position that I needed to take medication or at least put it off for as long as possible. It wasn’t something I had every made a connection with before, but it turns out our lifestyle has a huge impact on our health. We choose if it is a good impact or bad! 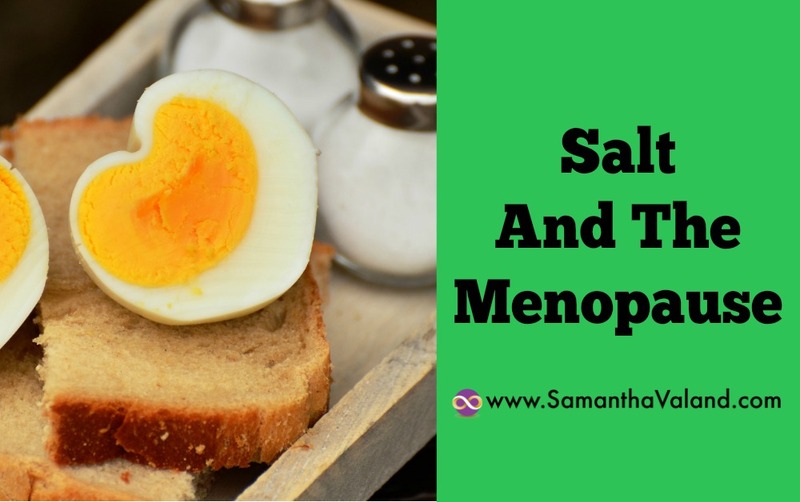 Our shape is often a priority during the menopause and we often reduce our calories to reduce weight when reducing our salt intake can often be the answer. Too much salt makes you retain water, which changes your shape in an unfaltering manner. If you have ever had this as a PMS symptom, it is not the most pleasant feeling, so it is worthwhile to monitor your intake for such a simple solution. Unfortunately, the highest amounts can be found in foods that we would often band as healthy. Shops bought soups in particularly can have a high salt content. It is useful when there is a label so you can check for yourself. Remember with labels check the serving size against the size of the packet, as they can be different. The recommended daily allowance for salt is under 6g. It is clearly labelled on packaging and often using the traffic light system so it is visually easy to tell if it’s OK as you are literally looking for green lights! It can be quite a challenge when you start to exclude soups based on their salt content; the choice is often quite restrictive. Stir-fry’s are a healthy staple in my weekly diets. They have lots of veggies and quick and easy to cook. However, the accompanying sauces are not usually quite as healthy as their salt levels can be high. As with the soups, they are usually easy to spot when you check the labels. Eating out is a challenge, as you do not know how much salt the chef has used as well as not knowing how many calories are in the meal. Sometimes you can speak to them and ask and others are not quite as forthcoming. Many bigger chain coffee and sandwich shops will make this information available, but as it, food often made locally onsite rather than at a factory you cannot be certain of quality control of ingredient contents. Reading your food labels and checking what you are taking in, do you add salt to every meal? I bet it is not something you measure. Just a sprinkle! Some foods just do not taste the same without a wee bit of salt, so pick your battles of where to use it and experiment with it. I love the simplicity of boiled eggs and sourdough bread, but it needs a wee bit of salt on them, so I save my salt allocation for them. Like most things, we are aiming for the Goldilocks attitude of not too much and not too little, just the right about. We need salt in our diets but it is finding the amount that is good for you. Do you have any experience with salt intake and how to get the right intake for you? I would love to hear from you.